Taylor Llamas has been the only North American source for pure Argentine llama genetics. We searched the Argentine altiplano and puna for the past 7 years, collecting only the most beautiful, unusual and correct animals for the herd of Llamichos, our Argentine partners. Overall, we selected less than one of every 200 llamas we saw. These are truly great animals, of a different type we have called The Argentine Type. About 4 years ago, a group of 40 of these select Argentine llamas was brought from Argentina to Temuco, Chile, as part of a triangle project involving Llamichos (Argentina), Llamas del Sur (Chile) and Taylor Llamas (US). For several years only the babies produced by these pure Argentine llamas in Chile were eligible for importation into the United States. 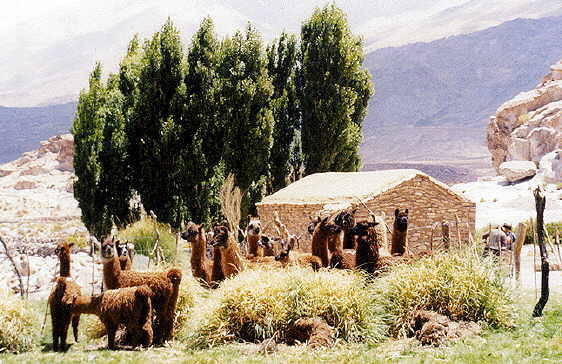 The first three baby males imported were sold as a group to a partnership of 6 US llama breeders. 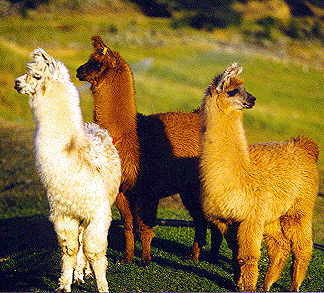 Taylor Llamas retained one of the shares in these animals, known collectively as The A-Team. In February of 2001 we received permission from USDA to bring the original Argentine animals from Chile to the US. The partnership held an online auction of these great animals in Temuco, in Chile, and sold 15 Argentine males and 31 Argentine females to buyers (including the Taylors) in the US. These animals were all imported successfully and are now with their new owners.